Powerful ultrasonic devices for continuous operation in standard- and special sizes allow flexible adaptation to the respective cleaning requirement. The devices offer all the well-known and proven technical features for practical applications. When selecting the appropriate bath, we base our decision on the actual requirements of our customers. Working volume and ultrasonic configuration are based on actual needs. 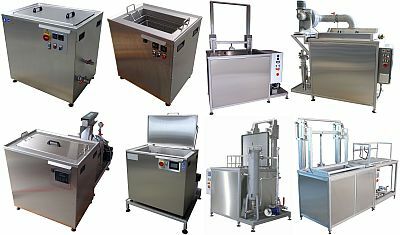 Whether the ultrasonic is mounted at the bottom or on one or more sides; oscillating goods movement with or without lift, stationary or mobile racks, circumferential spill edges, side suction, custom baskets & inserts, insulated lids - there are hardly any limits to the variety of equipment available. Depending on requirements, the units can be extended with optional peripheral devices such as rinsing tanks, dryers, filter units and oil separators. Another advantage of the individual device design is the inclusion of local conditions. Thus, e.g. difficult space conditions are taken into account in the device design. The concept of modular cleaning lines is based on the idea of combining standard components to assemble unique combinations of individual cleaning and rinsing stages and final drying that are designed to meet the corresponding requirements. When accessories such as variable transport systems, water treatment units, or robotic technology are added, modular cleaning lines guarantee a high degree of automation and high throughput. A comprehensive range of accessories such as oscillation units, bath maintenance systems, water treatment units, and wash baskets round out the product pallet as well as the possibilities. For the customer, this means lower investment costs through the use of standardized product lines as well as plant and process flow design flexibility for the particular application. Due to the ability to create custom combinations, changes or expansion is possible at any time later on. Together with an automation system, an economic cleaning process with a high throughput is available for use. Modular cleaning lines meet the complex requirements of industry. They are used universally in production and in service in almost all high-tech branches of industry. Fully automatic machines with feed and discharge stations use the transfer systems for small parts that are already available in many companies and feed them through washing, rinsing and drying stations. Every plant and its processes are designed individually. The automatic transport of the goods carriers by robot or push systems guarantees a uniform and rapid transfer of the products. By simultaneous treatment and transport of all batches in the plant high throughputs can be realized. The monitored cleaning process ensures consistent production quality.